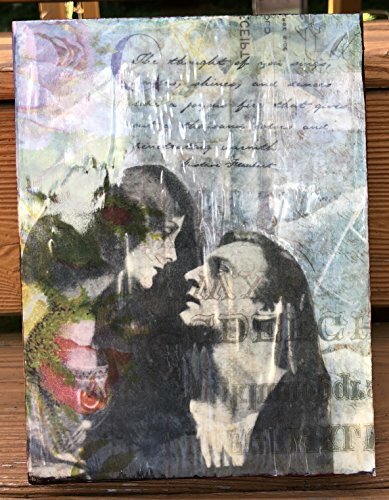 "Passionately Yours" is an analog mixed media collage featuring a 1920's era photo of Mary Astor and John Barrymore, legendary screen stars. The photo is as passionate as it gets, and the gentle layering and flowers set the tone further. The wood panel is 6x8 inches and 2 inches deep. It is sealed with a gloss varnish to protect it long-term. No hanging wire or hooks included; the collage can stand on its own on a shelf, desk or ledge.